Early summer is a great time to adjust our routines so that we make space to discern what is really going on--in us and in our community. This morning I got on my bicycle for a pre-breakfast ride. It was the first non-commute ride this year. As I rode, the phrase emerged: so much is locked up inside. Inside me. Inside others. I’m sitting with this metaphor of unwittingly becoming locked down. It is so easy to go through our days and suppress pain and push away anger. Stuffing our negative feelings is most natural, but doing so can lead us to hide away a lot of what is genuine within that we lock down what’s inside. There is so much within us that is often hidden away: wisdom, love and longing, hopes and dreams. I know what it’s like to feel estranged from these, and I often hear others lament a lack of purpose, but it doesn’t have to be this way. The question is whether we shall make the small changes required to have more access to what is going on in us--and then can attend to what is going on in the world. As I rode, tears welled up because recent stress has me locked down, and getting some exercise opened me up. I woke up to the reality there are a lot of people I’m connected to, there’s plenty of wisdom to access within, and all I need to do is show up honestly to both myself and others. Funny how we can feel so estranged from ourselves and then tweak our routine and we suddenly have access to what we really value. One routine we can adjust is having honest conversations with others. And another is reflecting on where our food comes from. 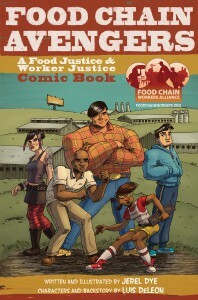 I recently talked with Jose Oliva, the co-chair for the Food Chain Workers Alliance campaign that has had great success in the Los Angeles area in raising standards for the food sold in public schools. Now they are organizing here in the Chicago area to get an ordinance passed that raises the quality of food sold and distributed to public schools and other institutions. Over the last few decades a lot of thoughtful people have brought our attention to where food comes from, how it is produced, the benefits of organic, the economic costs to mass production, the need for more local farming and urban gardening. But one thing that has long been overlooked has been the needs of the hands that feed us. There are 20 million people in the food industry in this country, many of whom are not making enough to feed their own families. It is so ironic that this country exploits food workers such they cannot make it without food stamps. A third of all food workers currently face wage theft, but many don’t protest for fear of losing their job--or being deported if they are undocumented. The campaign here in Chicago is to get an ordinance to oblige companies who sell, distribute, and serve food to children in the public schools must meet certain standards for the food and the treatment and compensation of their workers. The Unitarian Universalist Service Committee has contributed to the printing of a comic book that conveys the challenges and the opportunities for today. Take a look here! The next time you sit down to a nice meal, consider who has made it possible for you to enjoy it. If enough of us organize to call for higher ethical standards in the food industry, our buying power and our political power will call food corporations to do the right thing. Four and a half years ago, the Immokalee workers organized a campaign to increase wages for tomato pickers. The focus wasn’t on the growers but the corporations that bought the tomatoes. “A Penny More a Pound” was the rallying cry. Not very much, but it makes it possible for the workers to have livable wages rather than poverty wages. First Taco Bell, then McDonalds and many large corporations have complied. Except for Wendy’s. What will be the campaign that brings food harvesters, preparers, and servers the wages they need to raise their families without being in dire poverty? Just as we as individuals get locked down, estranged from ourselves, so our society fails to recognize what is going on. For too long the needs of workers have shoved out of public awareness. This will change as good share together. We often talk about changing our habits or routines when January 1st rolls around. But sometimes the winter is when we are most isolated. The summer offers an ideal time to add some exercise or get together with someone we value but haven’t seen for awhile. To sit down to meals and commit to the ethical development of our food.